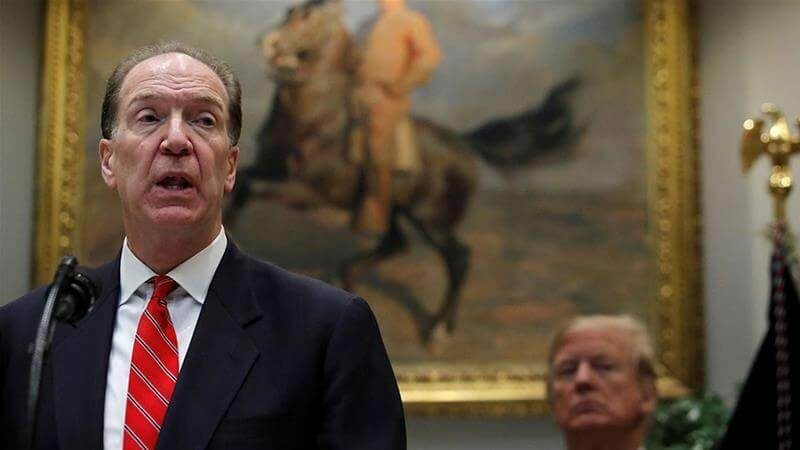 President Donald Trump of the United States has nominated US Treasury official, David Malpass, to head the World Bank Group. Malpass, a Trump loyalist and critic of multilateral institutions is the undersecretary for international affairs at the Treasury Department, who was recently involved in the US-China trade negotiations, has been a sharp critic of the World Bank, especially over it’s lending to China, who he noted has sufficient resources of its own. While speaking at the White House on Wednesday, Malpass disclosed that he would seek to implement reforms approved last year after negotiations to increase the bank’s lending capital by $13bn, such as curbing loans to and charging higher interest to higher income countries like China. “I’m very optimistic that we can achieve breakthroughs to create growth abroad that will help us combat extreme poverty and increase economic opportunities in the developing world,” Malpass said. He added that a key goal for the World Bank would be to ensure that women achieve full participation in developing economies. Malpass said he looked forward to working with Trump’s daughter and senior adviser Ivanka on her women’s global development and prosperity initiative. If his candidacy is approved, Malpass would succeed Jim Yong- kim, who announced in January he was stepping down three years before his term was set to expire amid differences with the Trump administration over climate change and development resources. The departure of Kim, who was first nominated by former US President Barack Obama in 2012, is likely to become a contentious fight between the Trump administration and other countries who believe the United States exerts too much influence over the bank, which is based in Washington, DC.